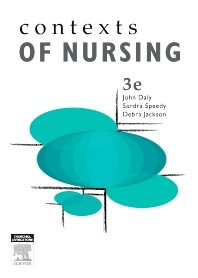 Contexts of Nursing 3e builds on the strengths of previous editions and continues to provide nursing students with comprehensive coverage of core ideas and perspectives underpinning the practice of nursing. The new edition has been thoroughly revised and updated. New material on Cultural Awareness and Contemporary Approaches in Nursing has been introduced to reflect the realities of practice. Nursing themes are discussed from an Australian and New Zealand perspective and are supported by illustrated examples and evidence. Each chapter focuses on an area of study within the undergraduate nursing program and the new edition continues its discussions on history, culture, ethics, law, technology, and professional issues within the field of nursing.